In 1991, the Netherlands did not participate in the Eurovision Song Contest because it was organised on May 4, traditionally a national holiday in Remembrance of the dead from World War II. 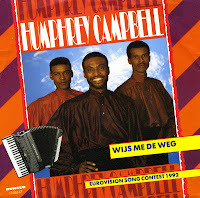 In 1992, the country returned to the Contest with Humphrey Campbell's 'Wijs me de weg'. Campbell was chosen during a national final in which ten artists sang ten different songs. 'Wijs me de weg' was written by producer Edwin Schimscheimer. At the close of the voting, the song received 67 points, finishing 9th in a field of 23 participants. The energetic live version must have contributed to this success. On the record, the song sounds unbelievably flat. 'Wijs me de weg' did not chart in the Netherlands. This was also the last Dutch song for Eurovision that was released on the 7" vinyl format.